Chicago has been host to many different kinds of events that fall into the sporting category, but the one scheduled Saturday, July 12 is hard to classify as it’s a version of the traditional Spanish Running of the Bulls. Called “The Great Bull Run,” it is one of eight such heroic displays of courage that are taking place across the US so far this year. 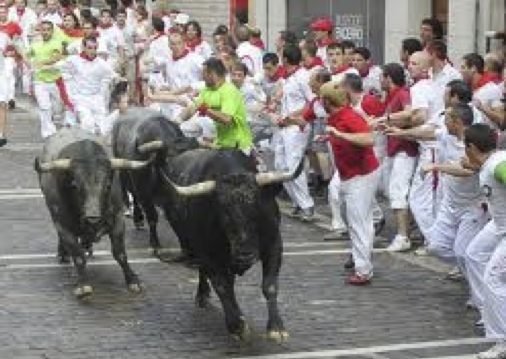 The authentic and original “Running of the Bulls” in Spain, however, is documented on DVD being released by Albert Nader’s Questar Entertainment and it comes directly from Pamplona, Spain. Begun three years ago, it was filmed at the 2013 festival in Pamplona last July. The hourlong program air on about 200 PBS stations, Nader says. “The Running of the Bulls” also marks Questar’s expansion into the acquisition of major programs from European producers for American TV, DVD ad web distribution. Chicago’s “The Great Bull Run” takes place at the Hawthorne Race Course in Stickney. About 1,000 brave souls have signed up to sprint alongside a stampede of bulls. AVANT GARDE JAZZ ARTIST Kahil El’Zabar is a musician, composer and teacher and has fans around the world, yet he is one of Chicago’s little known treasures. Fortunately, that will change when filmmaker Dwayne Johnson-Cochran’s compelling doc, “Be Known,” has a sneak premiere before it hits the festival circuit. It first screens Friday, Jan. 14 at the Gene Siskel Film Center at 8 p.m. Former Time music writer David Thigpen moderates the Q&A; live performance by El’Zabar’s Ethnic Heritage Ensemble, celebrating its 35th anniversary and post reception. Encore at the Colab Space, 312 N. Carpenter, 9 p.m., $20 donation. Post screening gathering with Ethnic Heritage Ensemble. IT’S BEEN 47 YEARS since the controversial Chicago Picasso was dedicated in Daley Plaza by Mayor Richard J. Daley. The occasion will be commemorated by the screening of two historic short films and screened in their original 16mm films. South Side Projections and Co-Prosperity Sphere are presenting the evening on Jan. 23, at Co-Prosperity Sphere, 3219-21 S. Morgan, 7 p.m., $5 donation. Watch for Ed Koziarski’s annual Reel Chicago roundup of production activity in 2013 and how many independent films were actually produced here.